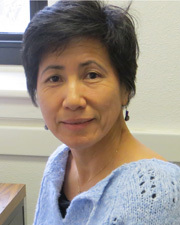 Ayako Mizumura earned her M.A. and Ph.D. in Sociology at the University of Kansas. She also has a B.A. in International Studies from the University of Oregon. She was born in Saitama, Japan and worked at international travel agencies in Tokyo for several years before moving to the United States. As a tour coordinator, she traveled to many Asian countries including Cambodia, Myanmar, and Vietnam as well as to Russia and several East European countries. Along with this travel experience, the study of sociology helped broaden her viewpoints. As a scholar, she has developed a methodological orientation to cross-cultural and comparative perspectives. Her research interests are interracial marriage, sociology of Japan, Asian military wives, and globalization in East Asia. She has taught numerous courses across the disciplines at KU, including Social Problems and American Values, Gender and Globalization in East Asia, East Asian Society in Global Context, Eastern Civilizations, and Japanese language. At the Center for East Asian Studies she manages CEAS’s new graduate (Master’s Degree) program in Contemporary East Asian Studies, which is expected to earn approval in the 2013-2014 academic year. She is enthusiastic about developing and managing this fascinating program and looks forward to meeting new graduate students and welcoming them to the program. At KU, she continues offering courses on East Asia.